Hi there! It’s already turning out to be a busy holiday season and it’s not even December 1st yet! I’ve been sorting through Christmas decorations and creating our advent calendar which I’ll be sharing with you later this week! Today, I took some time out for a little chalk therapy and created our Christmas chalkboard. You may have seen some previous posts about our chalkboard here and here. This time, I decided to add a little something extra to the chalkboard to give it a more finished look. I picked up some trim at Lowe’s for about a dollar a piece. After staining the trim, I trimmed it down to size and attached it to the edges of our chalkboard with my new brad nail gun. By the way, I love how easy this thing works! Why on earth did I not already have one of these??? Now time for some hand-lettering! 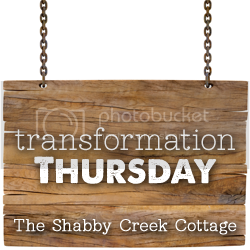 I found this design over at Holly Mathis Interiors. It’s actually her Christmas card design, and I loved it for our chalkboard too! You’ve got to check out her blog! So much eye candy and inspiration there! Don’t think for a second that you have to be some kinda artist to create your own chalk design. With just a few tips and practice, you can be a chalk artist! Here are just a few tips I’ve learned while working with chalk in just a short time. 1. Draw out your design on paper first. Start simple with just a quote that inspires you or a stencil, a doodle, whatevahhh makes you happy! 2. Use a measuring tape to find the center of your board. When drawing your design, sometimes starting in the center and working your way out will help keep it all in line. Speaking of, draw guide or grid lines if it helps keep it all in perspective for you. 2. 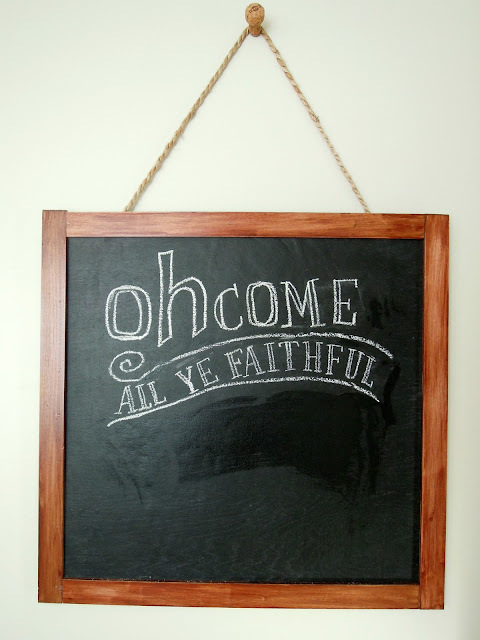 Keep the chalkboard wet and use wet chalk. I know it may look strange going on, but when it dries it’s 10 times better! 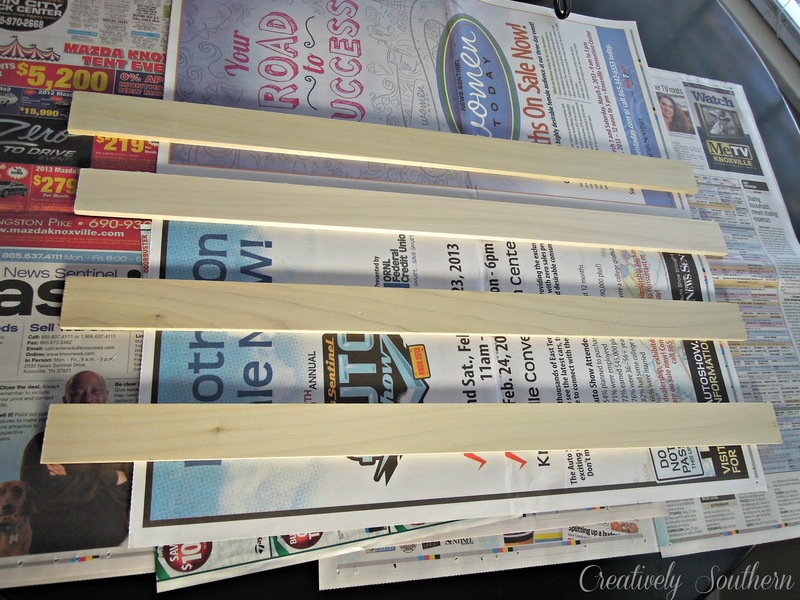 Use a wet Q-Tip to make small corrections (especially in tight spots) and to erase guide lines. 3. Remember it doesn’t have to be perfect. Did I just say that?? Me the die-hard perfectionist? This should be about something that inspires you, not about the design so much. Make it fun and meaningful! The creativity and design will come in time. 4. I write out my basic lettering on the board first, and then I go back and fancify (yep, that’s a word. right?). 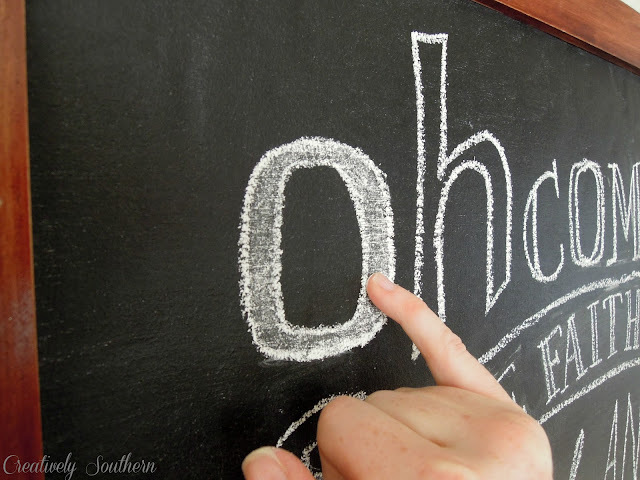 Use your pinkie finger to fill in solid lettering to give it a softer look. And lastly, practice practice PRACTICE! Like with many things, the more you do it, the better you will get. Just a couple of other things, you want to season your chalkboard first. I don’t mean rub it down with canola or vegetable oil and bake it… No. 🙂 Just rub the board down with the long side of a piece of chalk. Once covered, then erase it! Simple and easy. Also, if you are at a loss for fun and creative fonts, just go online and look for fonts you like. Keep it simple at first and then play around and try to recreate it in your own way! That’s all there is to it! No artist degrees or certifications required! What inspires you? 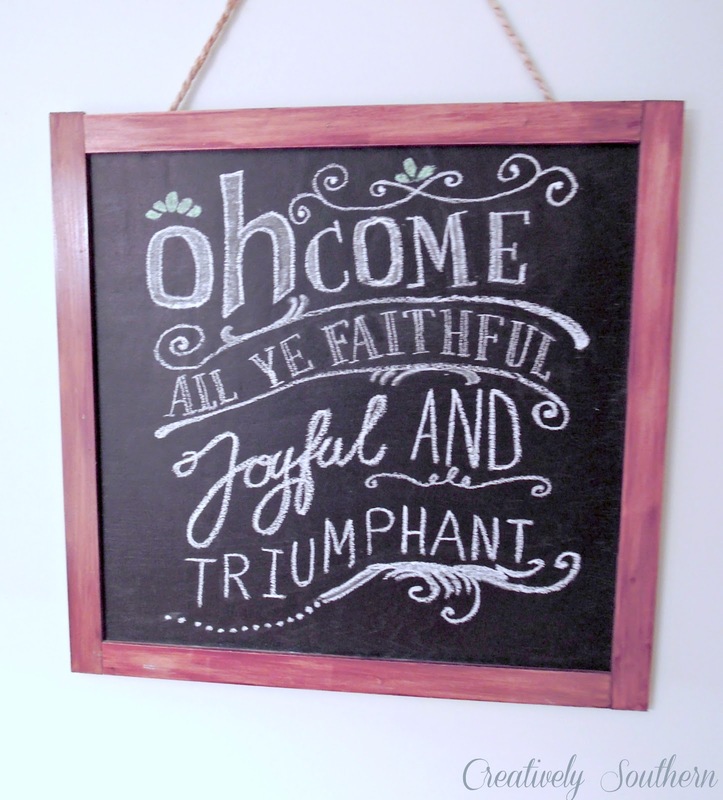 Have you ever tried hand – lettering your own chalkboard? 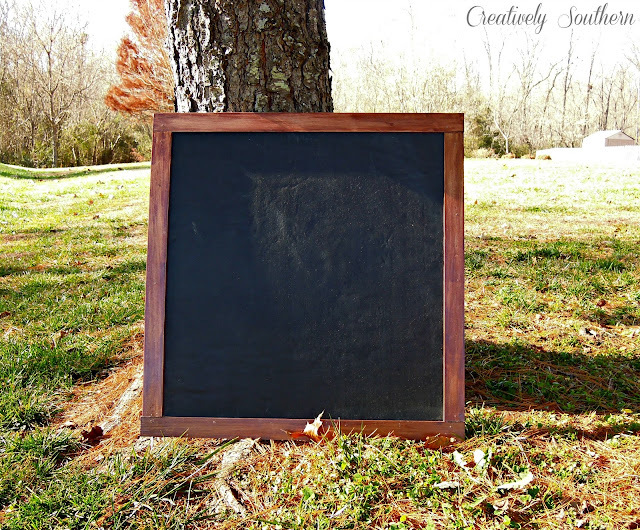 Grab some chalkboard paint and tell me what you end up creating! Thanks for stopping by and Happy Holidays! This was really helpful! I have a giant chalkboard in my dining room that is just asking for some help! Now I have think of something clever to write….yours looks great! 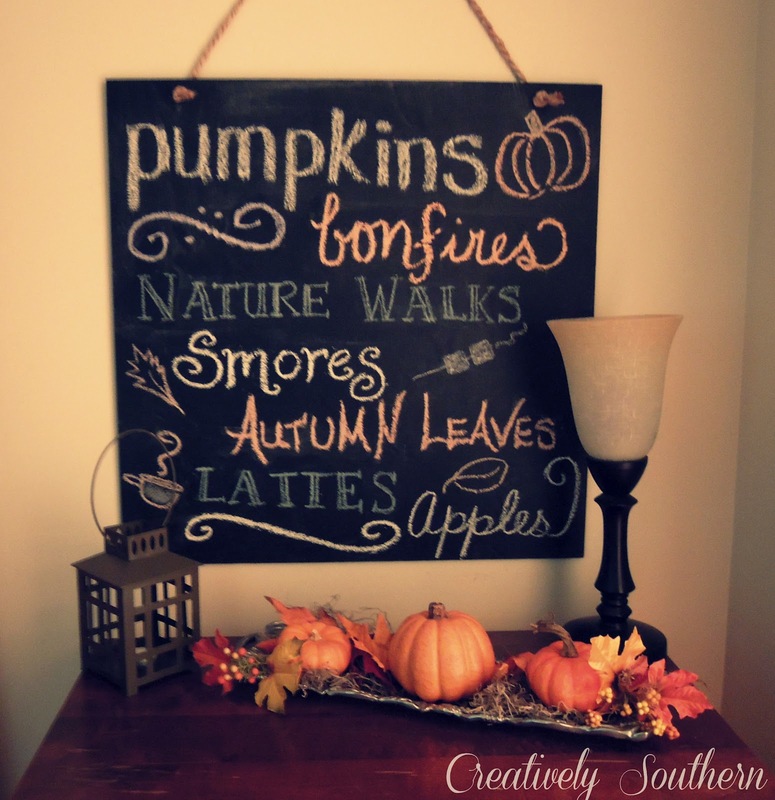 I love the chalkboards! Great tips too!! I love looking around your lovely blog. I found you on the hangout last night. So happy I did. I am a new follower too. I would love for you to stop by http://www.homesweetbutterfly.com. Have a great weekend and hope you get done with your Christmas decorations. It looks adorable and I just recently figured out the “wet chalk” tip too! 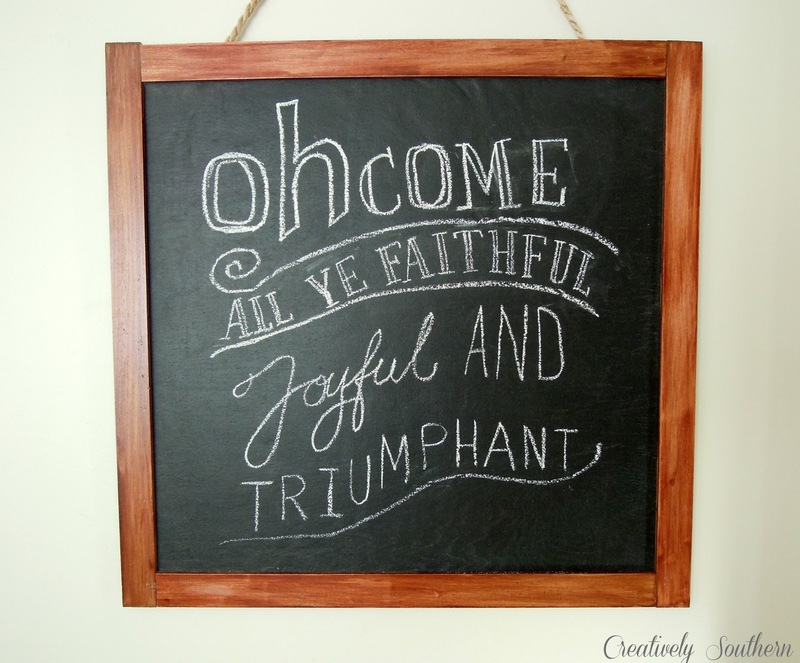 Thanks so much for sharing this with us at Inspiration Friday this week! These are fantastic tips! I am terrible when it comes to writing on my chalkboard stuff with actual chalk and usually turn to the chalk markers. Thanks for sharing. Visiting from Savvy Southern Style. 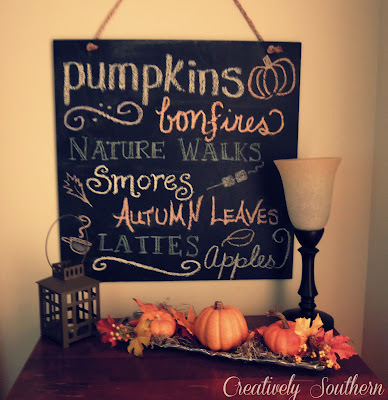 Great tips and your chalkboard looks wonderful! 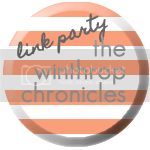 Following you now (and pinning this) Thanks for sharing! I’ve tried a few things on my chalkboards but practicing even a few times and following some tips like starting in the center definitely do help. It’s fun to see what others create. Your board is beautiful! What a great tutorial! I’m beginning to play with chalk art but still have a looong way to go!! Thanks for inspiring me to keep going! Love your chalkboard and the great tips you have mentioned! thanks for the tip on using wet chalk- did not know that! Your trimmed out board looks great.